My baby turned eight today. She was so excited for this day, in spite of the fact that I kept begging her to stay little. The little snot doesn't listen to a word I say. There's a reason why we call her Stinkerbell. I had one of my secretly proud, probably shouldn't be proud, parenting moments yesterday. On the way home from school she told me that a little boy in her class put her in a head lock, and she turned around and punched him in the stomach. I know I should have said "We don't solve our problems with violence, sweetie." I said, "I hope no one saw that." As in, I hope you didn't get caught because, You Go Girl! Tell that boy not to mess with you! My Little Flower, she is not. 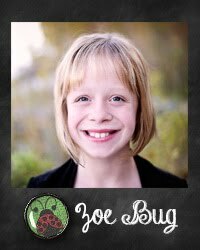 That's Zoe Bug. She's a Delicate Flower. Stinkerbell . . . is a Scraggly Weed. The red silky shirt you see The Stink wearing is actually Zoe's shirt. Annika has been coveting it for two years. She begs and begs Zoe to let her wear it. Finally today, for the momentous occasion of her eighth birthday, Stinkerbell was permitted to wear the Coveted Silky Red Shirt. We had her birthday party after school at the movie theatre. You know what that means . . . I didn't have to clean my house. Whoo hoo! I love me a good off-site b-day party. We saw the movie "Hop" at the theatre, and let me tell you, it was silly. The animated characters were adorable and had cute personalities, but the main human character was a little hard to take at times. 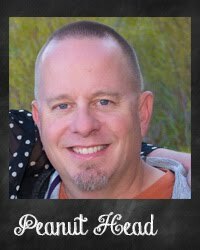 Peanut Head and I had to pause for mutual eye rolling and exaggerated pretend vomiting several times. We were the adults in attendance. The fun part for me was making the party favors. I found the cutest digital kit, Kate Hadfield's Movie Night, almost a year ago. 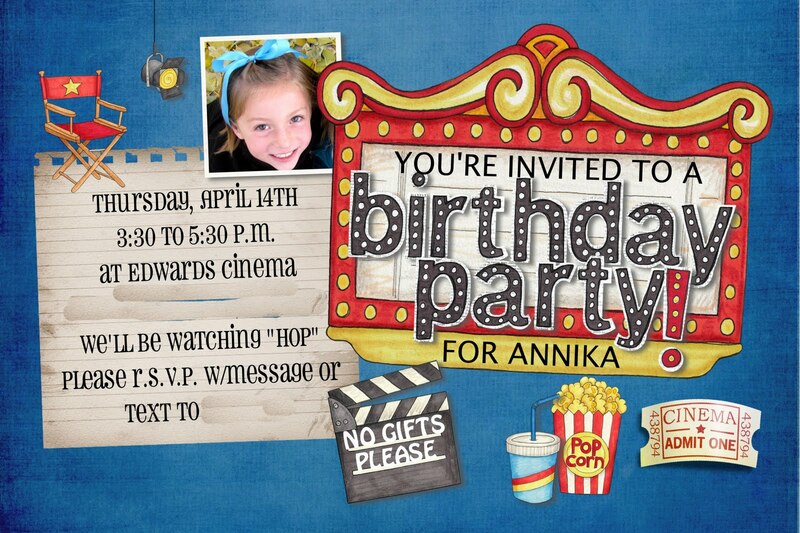 That's when I decided that Annika's next birthday party was going to be a movie party. I am quite experienced at creating the Kodak moment around the coordinating scrapbook sticker, and this was just another version of that. 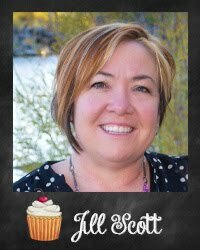 "I have a Potty Training Sticker Sheet and we are going to potty train if it kills me. I don't care if you're only eighteen months old. I own the sticker sheet!" I may or may not have done that. I scored the popcorn containers at the Target Dollar Spot, two for $1. I filled the popcorn containers with Hop-worthy items. Then I stuffed the whole shebang in a clear goodie bag and tied the digitally created tag on with a piece of ribbon. I love my digitally created artificial Kodak moments. Awesome birthday bags...and I love it that your daughter punched a boy in the gut and you didn't scold her. My daughter did something similar last year-a boy hit a girl in a grade under them. Back in class he dropped a pencil on the floor and my Lu stomped his hand. I blew diet coke out my nose when she told me this...I was SO SHOCKED. Well, a big happy birthday! Turning 8 is a big deal, Jill; only two more years until double digits! : ) The favors were perfect. Such cute ideas!!!!! I can't believe the amount of work even if it wasn't in your own home. I am convinced that you never sleep. 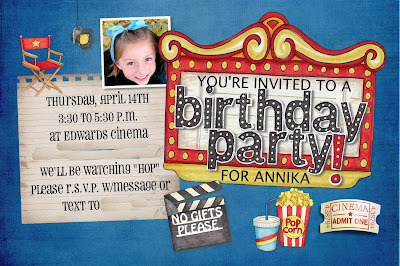 The friends of your daughters must squeal with delight when they get invited to one of your parties. Happy birthday to the baby girl! A side note: Bullies of the world need to be shaking in their shoes. The downtrodden are starting to revolt. Last year my son was tired of being bullied by a boy who was a foot taller and 50 pounds heavier. One day he snapped and threw his shoe at the bully, then punched him in the chest. The bully kept retreating and my son kept punching until they got to the staircase and my son was ready to send him flying down. That's when his classmates stopped cheering and decided to go get a teacher. The kid never bothered him again. Yeah, I thought about telling him that violence was not the answer but sometimes that's all the little tyrants understand. Nobody's gonna mess with your baby girl! I just love this idea. Is there post for the potty training chart? My daughter refuses to go on the toilet. I've tried, litterally everything. Looks like she is going to have a great party! the treat bags are SO cute!! Wow you are an awesome mom! Love the party favors and tags. woo hoo for birthday parties! 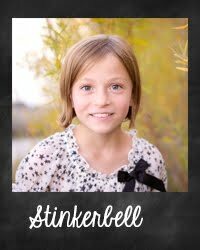 Happy birthday to Stinkerbell! we may are having our own birthday party this weekend- the big 3, for a certain little tiny guy. :) Its all superheroes, all the time! You are so amazing Jill. I love your ideas. As always, thanks so much for sharing with us! I'm glad your not-so-little one had a lovely birthday (and that you didn't have to clean your house). Awesome! Just curious where you found your movie, popcorn, pop digital embellishments? Thanks!